A journey with Hurtigruten is characterised by the dramatic landscape, the 34 ports en route and the unique atmosphere that stems from the 120-year long history of the fleet. There is no better way to experience Norway’s iconic coastline. 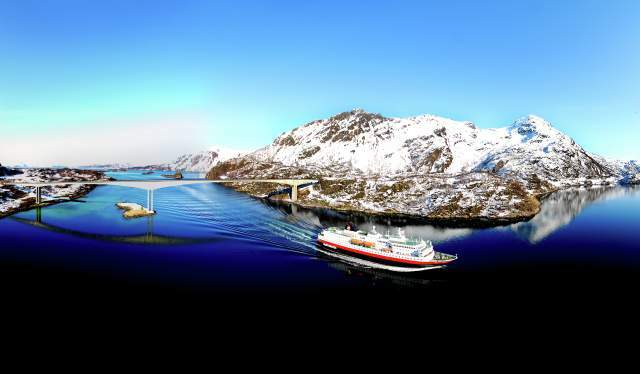 Once you have selected your Hurtigruten voyage, you have a number of arrival and departure options depending on where your journey starts and ends. You also have a choice of departure airports. This is the ultimate voyage with Hurtigruten, covering over 2500 nautical miles. The ship visits the 34 ports twice, so if you miss anything going north you have a second chance on the voyage south. From the iconic, sheltered waters of Bergen, you sail towards the border town of Kirkenes. En route you will experience the wonders of Arctic Norway. This voyage combines many highlights of the Classic Round Voyage. From Bergen, you cross the Arctic Circle twice, pass the North Cape, visit the turning point of Kirkenes and finish in the medieval city of Trondheim. The highlights include sailing through the beautiful Vesterålen and Lofoten Islands in daylight, the Seven Sisters mountain range and the peculiar Torghatten Mountain, with its legendary hole in the middle. Experience the spectacular fjords, the beautiful coast of Helgeland and a RIB boat safari in Lofoten. Enjoy the relaxing atmosphere and delicious food. On this four days journey you will see the beautiful Lofoten Islands, the mythical coast of Helgeland, the Atlantic Road and the UNESCO listed Vega Islands. On this journey you can visit small coastal communities, enjoy the exotic nature along the Arctic coast and experience the North Cape. On this two-day voyage you visit the big cities along the Norwegian coast with beautiful fjords and sheltered areas. Hurtigruten is perfect for shorter breaks. Imagine relaxing for a few days with excellent food and service, spending your time on deck or in the panorama lounge admiring the stunning scenery as you sail gently along the Norwegian coastline. With airports at most bigger cities and ports – and 34 ports of call available, there are plenty of possible combinations, including a tailor-made ‘port to port’ voyage. You can even bring your car and explore the beautiful scenery as part of a road-trip. Take the opportunity to see more of Norway’s scenery by adding a few extra nights before or after your voyage with Hurtigruten. Perhaps you want to explore the Norwegian fjords and mountains, or experience life in Oslo or Bergen. 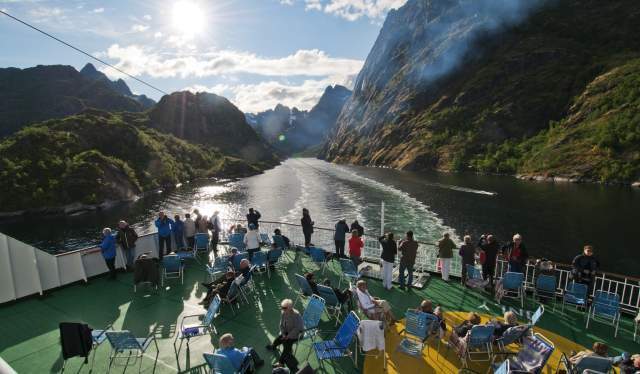 Hurtigruten also offers stunning round trips such as ‘Norway in a nutshell’ or ‘Sognefjord in a nutshell’. If you plan to visit in the winter, you can spend a night in a hotel made entirely from snow and ice.